I could be writing, it’s true, about gun violence here and there. (Been there, wrote that, but there’s always more.) I ought to explore the tangled feelings of a frayed and stubborn father and his proud, combative son. (It wouldn’t be the first time.) There are Things to be Said about the two troupes of (mainly) 14-year-old boys that I’m spurring/goading/inspiring/herding toward basketball excellence, so impatiently. (How about now? Can you hear me NOW?! Why aren’t you trying harder?) And how about those Warriors, and the hardwood genius of Stephen Curry? And, like, all those other like sports thingies? I’ll be getting to those. Probablymaybe. Soonerorlater. 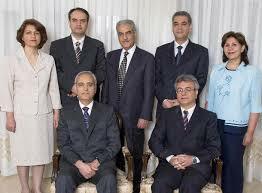 But today, as I promised myself and The Usual Lurkers here at JH.com, I’m thinking about the last of the Iranian Seven, prisoners now on the most trumped-up of charges – weird how, suddenly, “trumped-up” accusations have a whole new layer of meaning – for over 90 months. I want you to know about and remember Vahid Tizfahm. You might not have heard of him, or his six brothers- and sisters-in-nobility, but I’ve written about each and I’ve been re-issuing the call. They’re still in jail. Their names are listed below. There’s one, though, that I want you to read RIGHT NOW (sorry, no need to shout, I guess, not really, but wow) is this updated profile of Vahid Tizfahm, in which I include links to three remarkable — I dare say nearly incredible — letters written by (or partly by) Mr. Tizfahm. * Clearly, he had to be stopped! 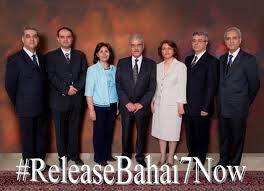 Mr. Rezaie was the fifth of the seven “friends” (Yaran) who had taken on the job of looking out for the needs of the oppressed Baha’i community in Iran, the land of its birth. In the past few decades, their elected councils have been outlawed, their reputations slandered, their businesses shuttered, their youth deprived of education, all in the wake of the execution of hundreds of believers following the “Islamic” revolution in 1979. Even the Yaran, voluntary leaders of the oppressed community, were arrested, and Mr. Rezaie and his colleagues are now halfway through their eighth year of unjust imprisonment in two Iranian jails. He — and his six partners in the most benevolent, world-minded sorts of “crime” you could imagine — were the focus last May for the international #7Bahais7Years campaign, and this was my homage to Mr. Rezaie. The Seven are enemies of an insecure state simply because of their membership in a community enduring nearly two centuries, now, of slander and persecution in their homeland. Agriculture is quite old-fashioned. Who needs it? Who even cares? It’s as if we’ve gotten so modern and giga-groovy that we don’t have to think about food production at all, and if we do, chances are it’s not much more than a glimpse: an idyllic image of a family farm on some supermarket packaging, an image that bears about as much relationship to modern agriculture as fish do to fish sticks. This advocacy for the preeminent importance of the farmer was, even then, a relatively doomed notion, as more and more of us became city-dwellers and ever more remote from the reality of food. (Never mind where babies come from – where does chicken or Cheez Whiz come from?!) And yet, it’s still a concept that we might find useful, this making-sure-we-can-feed-ourselves-not-just-cheaply-but-healthily-and-sustainably thing. Y’know, the small stuff. Re-wind 7.5: Who’s Afif Naeimi, Again? I may yet write the darned things. ¹Not a real word. (‘Til now.) ² Not its real title. The Quietly Magnificent Seven, in freer times. Community service becomes treason to a government bigoted and paranoid. The short answer to the title question above is that, for the fourth day in a row, I’m reminding a vanishingly fine slice of humanity — you guys, the ones who read my stuff — about the seven Baha’i leaders who, by all accounts, remain amazingly resolute and even light-hearted about the kangaroo-court decision that put all of them in jail seven years ago. (Well, it was seven years last May, when I wrote this series of profiles as part of the #7Bahais7Years consciousness-raising campaign. It’s now seven-and-a-half.) They are awesome. Six months ago nearly to the day, I wrote: “The Seven are enemies of an insecure state simply because of their membership in an often-ostracized community, which has been subject to nearly two centuries of bigoted slander from the entrenched shiah orthodoxy in what was once Persia, now Iran.” Not exactly Twitter-verse, but not a bad sentence, if I do say. I then went on to write about my getting to know the fourth, Afif Naeimi, andthat’s the point of this short post. I commend him to your attention. ³ Or, I suppose, you could search this site and find it lickety-split back in May, talented human that you are.